Interests: HO, On30, G/Hn15, regular G, kites, model rockets, the occasional model boat, retro sci-fi miniatures game. 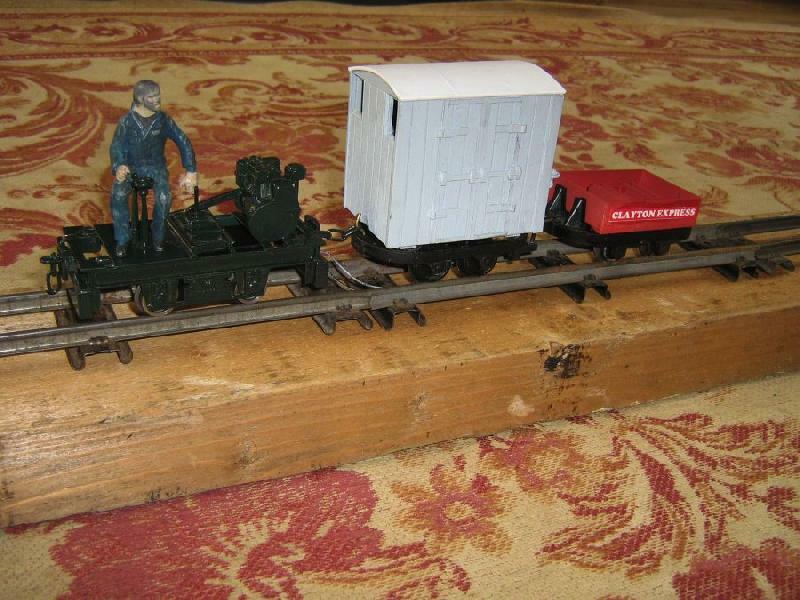 Neill Clayton has been a well known figure up north,and used to bring some 40cm gauge stock to Narrow Gauge North. Neill is always happy to talk to enthusiasts - contact details are on his website. There is quite a lot on site - 2', 18", 50cm, 40cm & 15" in various forms. 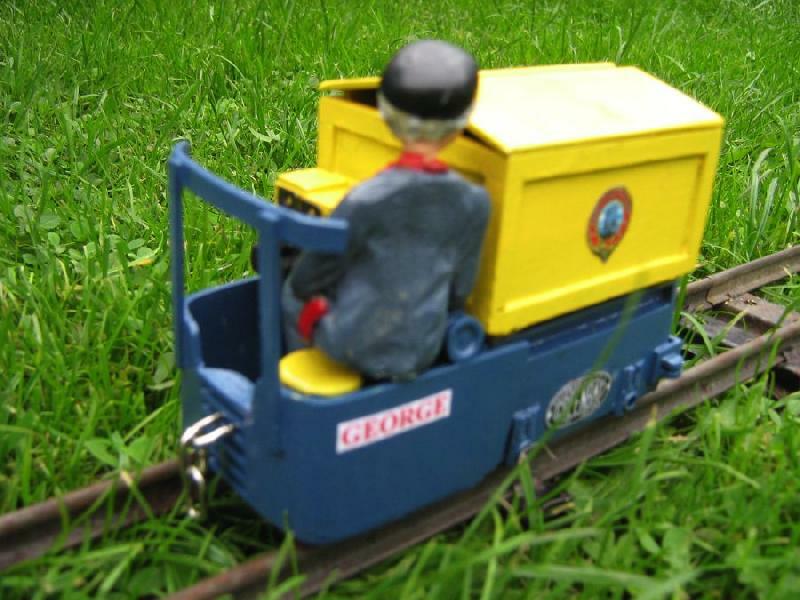 The current addition is the Greenbat battery loco from the Abbey Light Railway - link http://www.freewebs.com/abbeylightrailway/no12.htm. this will now join some of its original wagons and track. The main line is pretty splendid taking in a horseshoe curve, canal side wharf and ending in the yard for the industrial units with junctions into the engine shed, museum and workshops along the way. Unlike larger lines you have to drive the loco as the curves and gradients make it a challenge. Despite being ill I had an afternoon with Neill yesterday to check out his newly aquired Greenbat - it hasn't worked since he tried to charge it but a purchase of 29 litres of distilled water cured the problem so Neill now has battery & diesel options with petrol to follow on. I have had a few fun days at Neill's recently. On the first trip I took a retired neighbour there for the day and fitted the correct bearings into the new Lister to make it a rolling chassis before assembling a large overhead hoist in the museum building. Of course we played trains a bit too. We also had an evening trip so that my Aunts could have a go - I took my neighbour's 6 year old son along too and showed him how to drive the Greenbat - he's very good indeed with this considering his age. Pity no one told me he hadn't had any tea but he had a good time anyway. The last trip was to repair my written off Vauxhall Astra . In theory you need new panels, body jigs, hydraulic rams etc but what we actually did involved a chain and a 1936 Lister - a few good pulls brought it back to where it should be. Not what you would normally expect but it worked. 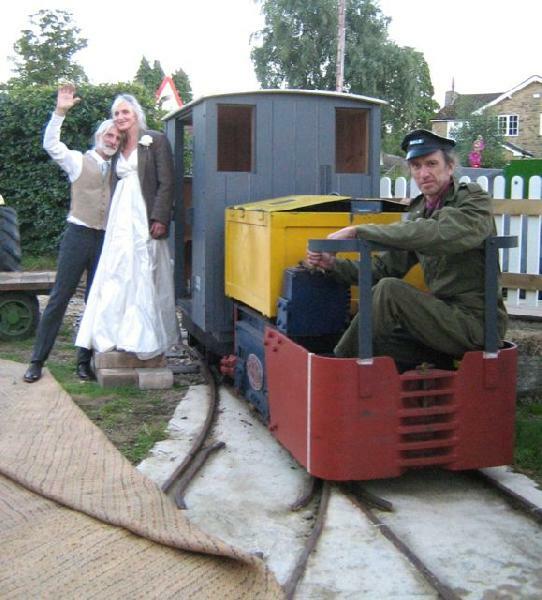 Having got the bride and groom to a temporary platform outside the reception the best men were asked to run some extra trains for the guests - this went down very well. The Lister went to bed just as it got dark with a garden light thing on the buffer beam so that the crew could see where we were going. Last edited by Adam Roper on Tue Sep 10, 2013 2:36 pm, edited 1 time in total. Great news! And what fun too. But photos, we must have photos - please! Adam is not set up for popping photos onto the Gnatterbox, but has kindly sent me some to do the honours with. If he will pardon my saying that several are quite similar I offer the following, lightly Photoshopped jobbie for your enjoyment.Surely this is how all weddings should be done? The matting is for the evening dancing - we couldn't have got them any closer to the reception if we'd tried. And indeed all weddings should be this way! 'The models are 16mm scale based on bits from the I.P. Engineering range but have been modified a bit to represent the real railway. The Lister has been made as close to scale as possible – the standard kit is really for 45mm gauge and has been beefed up to look right for a 3’ gauge loco. 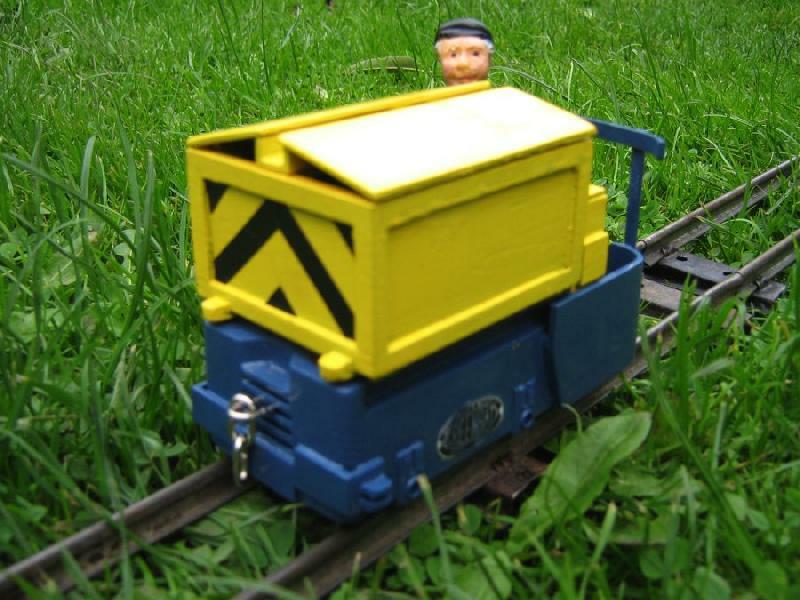 In reality virtually all Listers were 2’ gauge so the model has been reduced in width to as close to scale as possible while the chassis has been fitted with smaller wheels to get the height down as far as possible. Real Listers are 3’ wide with around 2” ground clearance – the model isn’t quite like that but it isn’t far off. The engine unit has 2 cylinders where the kit only has 1 – a small detail but it makes a difference if you’re used to the real thing. The van is a scale model of Neill’s van and is not too far out – the photograph makes it look a bit rougher than it really is as flash photography is rather cruel at times. The van has the batteries and switches inside as there isn’t room under the reduced width Lister. The ring carrier has no known prototype but is painted and lettered to match the Nissan truck Neill used to use for his haulage business – it’s made of a skip chassis with a balsa wood body and will go back to being a skip shortly. Borrowing skip chassis for temporary wagons is a very old practice in all scales right up to full size. The model of Neill took a bit of doing – it started out with a flat cap which took a bit of carving off. The pony tail is made from solder and took ages but it does look like Neill which entertained his grandchildren. Pity about the paint wearing away – I must repaint it sometime. The track is Hornby tinplate which worked very well indeed. Any chance of some pictures of your 16mm scale greenbat? The model of Neill took a bit of doing – it started out with a flat cap which took a bit of carving off. The pony tail is made from solder and took ages but it does look like Neill which entertained his grandchildren. You do realize that it is possible to obtain 3D printed characters modeled from a series of photos nowadays ? It is indeed his trainset - he just lets me play with it sometimes. As requested, the 16mm model, info and pics courtesy Adam. The Greenbat is made from plastic sheet with I P Engineering wheels, axles and motor etc. The switches look a bit crude but they are in the right place as the real thing has its controls on the same box. The driver looks a bit dwarfed but in reality your head is about there anyway. Works plates etc are printed and laminated on the office printer while the wasp stripes are from electrical tape. That George model looks great, and the first time I've seen a Greenbat modelled in 16mm really. I keep intending to build a 16mm George to replace my terriable card model I did many years ago! Only just found this thread. I am exceptionally glad that Neil has the Greenbat. I bought it from Chemical and Insulating in Darlington twenty odd years ago, almost prising it out of the hands of the scrappies (They were scrapping the site from one end whilst I was extricating the railway from t'other). Neill helped me recover the loco which we moved on his massively overloaded Nissan Cabstar. The loco never ran in my ownership and I soon swapped it with the late Peter Lowe of the Abbey Light Railway for the remains of Lister 11410/1939 which is still in my ownership. Glad that it has gone to a good home and is in safe hands. We think Terry Stanhope beat you to it and got the lamp before you got the loco. Either way we had it out on Sunday for a run up and down the line. I have very little time these days but it was good to get the stock out - if anyone wants to visit please call Neill on 01765 690906 and we will show you round. Neill and I moved the loco from C&I before Terry got involved. I did a deal with Cape Insulation who owned and were closing C&I. The loco was moved just before Cape shut the site. After Cape abandoned the site I started lifting the railway. I was pulling the railway out of one end of the works whilst the scrappies were working at the other. I bailed out when the scrappies started cutting into some tunnel kilns which had been welded shut in the 1960s - before the Cape lads left they told me to go nowhere near the kilns, I took their advice. It was only after I left that Terry got directly involved, buying kit from the scrappies. If memory serves Terry bought some rail (14lb/yd), kiln cars and at least one battery electric traverser car. These ended up at his 15" railway at Arthington Gas Works. I believe some of this kit was later stolen by pikies. In all probability Terry didn't come into contact with the loco until it arrived at Peter Lowe's Abbey Light Railway.